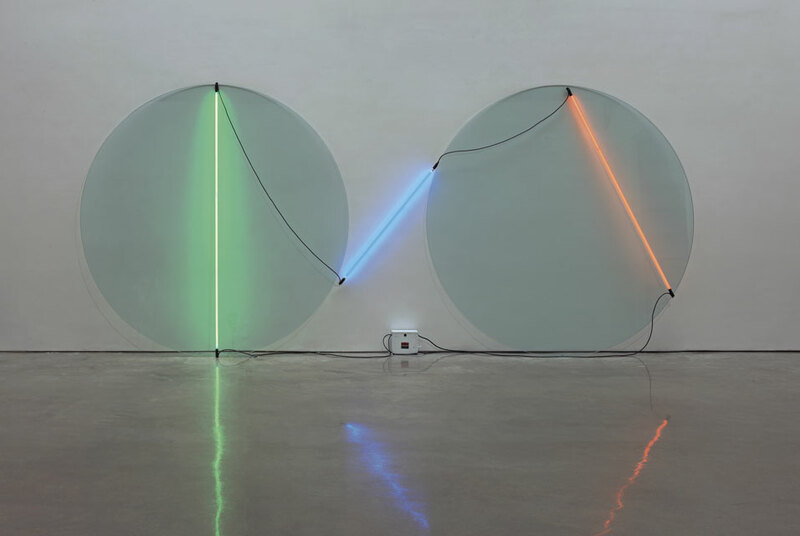 Elysian Plain + Early Works by Keith Sonnier” opens at Pace Gallery New York Ba-O-Ba V, 1970. Neon, glass, electrical wire and transformer, 84″ x 17’x 18″ (213.4 cm x 518.2 cm x 45.7 cm). NEW YORK, NY.- Pace Gallery announces Elysian Plain + Early Works by Keith Sonnier. The exhibition will include 11 works in neon featuring the first series created in Sonnier’s new studio in Bridgehampton. The exhibition will include early work from the artist’s BA-O-BA, Neon Wrapping Incandescent and Neon Wrapping Neon series. Elysian Plain + Early Works will be on view at 510 West 25th Street from January 24 through February 22, 2014. Sonnier was part of a group of artists who challenged preconceived notions of sculpture in the late 1960s by experimenting with materials. In Sonnier’s case, materials ranged from latex and satin, to found objects, transmitters and video. In 1968, the artist began creating wall sculptures using incandescent light and sheer fabric. Frustrated by the standardized forms of incandescent light, he started experimenting with neon. Using copper tubing as a template, Sonnier began sketching lines, arches and curves ultimately realized in glass tubing enclosed neon. The linear quality of neon allowed Sonnier to draw in space with light and color while colored light interacted with the surrounding architecture. Pace will exhibit for the first time the artist’s Elysian Plain series. In his new studio on Long Island’s East End, the artist experimented with different forms of neon, acrylic and aluminum, and transformers, to create a series of wall-to-floor constructions. In each work, hardware is paired with the seductive qualities of light and color. Sonnier’s new series will be on view with work from the late 1960s. Pace will exhibit the artist’s Neon Wrapping Incandescent, 1969, displaying curved rods of blue and pink light. The exhibition will also include work from the artist’s Neon Wrapping Neon series, in which Sonnier extends glass enclosed tubes of neon from the walls outward with leg-like extensions into the center of the space. Also on view will be Ba-o-Ba V, 1970, comprised of two circular panes of glass, neon, transformers and wire. Deriving from a colloquial term from the artist’s Cajun upbringing, this seminal series has developed over the past 40 years. In 2003, the artist transformed Gordon Bunshaft’s iconic Lever House with a site-specific installation as his first major architectural presentation in New York City. Prior to BA-O-BA Lever House, Sonnier explored the possibilities of neon with a temporary installation for the exterior of Mies van der Rohe’s Neue Nationalgalerie in Berlin in 2002, entitled BA-O-BA Berlin. Over the past two decades, Keith Sonnier has received international recognition for his large-scale works specific to renowned landmarks. In 2000, the artist created a temporary neon installation on four facades of Peter Zumthor’s Kunsthaus Bregenz in Austria, entitled Millennium 2000. The large-scale installation coincided with the exhibition Keith Sonnier: Environmental Works 1968-99. In 2004, the artist created one of Los Angeles’s largest public installations. Motordom (2004) illuminates the courtyard of Thom Mayne’s Caltrans District 7 Building as a permanent installation of red neon and blue argon. Most recently, the artist’s work was exhibited by the Fondazione Prada as part of When Attitudes Become Form: Bern 1969/Venice 2013. The Venice presentation was a remaking of the radical Live in Your Head: When Attitudes Become Form: Works, Concepts, Processes, Situations, Information, curated by Harald Szeemann and included work by Keith Sonnier originally presented at the Kunsthalle Bern, Switzerland in 1969. In the same year Sonnier’s work was included in the Whitney Museum of American Art’s groundbreaking Anti-Illusion: Procedures/Materials curated by Marcia Tucker and James Monte in 1969. The exhibition was the first large presentation of Post-Minimalism in an American museum. The artist’s work is currently on view as part of the Parrish Art Museum’s annual Artists Choose Artists exhibition through January 19, 2014. In March 2014, the University of Lafayette, Louisiana will recognize Keith Sonnier with a Lifetime Achievement Award and an exhibition of his work. Elysian Plain + Early Works is Keith Sonnier’s third solo show with Pace Gallery. Keith Sonnier (b. 1941, Louisiana) radically reinvented sculpture in the late 1960s. After graduating with a B.A. from the University of Southwestern Louisiana, Lafayette in 1963, he went on to receive an M.F.A. from Rutgers University in 1966. Employing previously unusual materials, Sonnier, along with his contemporaries, Eva Hesse, Barry Le Va, Bruce Nauman, Richard Serra, Joel Shapiro, Richard Tuttle, and Jackie Winsor, called all previous conceptions of sculpture into question. Sonnier experimented with a wide range of materials and in 1968 began working with neon which quickly became a defining element of his work. Sonnier has been the subject of more than 130 solo exhibitions and has participated in more than 360 group exhibitions throughout his career, including: Documenta 5, Kassel (1972); Keith Sonnier: Neon (1989) at the Hirshhorn Museum and Sculpture Garden, Washington, D.C.; Keith Sonnier: Porte Vue (1979) at Musée National d’Art Moderne, Centre Georges Pompidou, Paris; Projects: Keith Sonnier (1971) at the Museum of Modern Art, New York; the Venice Biennale (1972, 1982); the Whitney Museum of American Art’s 1970 Annual Exhibition: Contemporary American Sculpture, Biennial Exhibitions (1973, 1977), and The New Sculpture 1965 – 1975: Between Geometry and Gesture (1990) which later traveled to the Museum of Contemporary Art in Los Angeles. Sonnier’s architectural neon installations in public spaces have earned him wide acclaim in an international context. More than 20 important public commissions by the artist have been realized since 1981. Included among these commissions is Lichtweg (or Lightway) at the New International Airport, Munich (1989-1992), a permanent installation that spans the 1,000 meter walkway of moving sidewalks, linking terminals and orienting passengers in a pathway of light. Additional installations include: Kansas City International Airport (2006); Munich Re Headquarters in Munich (2002); Pfarrexpositur St. Franziskus, Roman Catholic Church, Steyr, Austria (2002); Ronald Reagan Building and International Trade Center, Washington D.C. (1998); Bureau of the Census, Bowie, Maryland (1997); and the Miami International Airport (1996). Sonnier’s work can be found in dozens of public and private collections worldwide, including the Hara Museum of Contemporary Art, Tokyo; Kaiser Wilhelm Museum, Krefeld, Germany; Kunstmuseum Liechtenstein, Vaduz; Kunstverein St. Gallen, Switzerland; Musée National d’Art Moderne, Centre Georges Pompidou, Paris; Museu d’Art Contemporani de Barcelona; Museum für Moderne Kunst, Frankfurt am Main; Museum of Contemporary Art, Los Angeles; Museum of Contemporary Art, San Diego; Museum Haus Lange, Krefeld, Germany; Museum of Modern Art, New York; National Gallery of Australia, Canberra; New Orleans Museum of Art, Louisiana; Parrish Art Museum, Water Mill; Smithsonian American Art Museum, Washington, D.C.; Sprengel Museum, Hannover, Germany; Städtisches Museum Abteiberg Monchengladbach, Germany; Stedelijik Museum, Amsterdam, and the Whitney Museum of American Art. In 1974, Sonnier was awarded first prize at the 9th International Biennial Exhibition of Prints at the National Museum of Modern Art, Tokyo. He was also two-time recipient of the National Endowment for the Arts Grant (1975, 1981), and was awarded the John Simon Guggenheim Memorial Fellowship in 1974. His many accolades include the 2013 Arts and Letters Award in Art presented by the American Academy of Arts and Letters. Keith Sonnier currently lives and works in New York City and Bridgehampton, New York.